The European Space Agency's Columbus lab takes center stage in this view from the outside of the International Space Station taken during the STS-122 mission. PARIS- With fresh money from its member governments and an apparently renewedenthusiasm among microgravity scientists, the European Space Agency (ESA)expects to send out requests for ideas by midyear on how to use Europe'sColumbus laboratory aboard the International Space Station in the coming years. 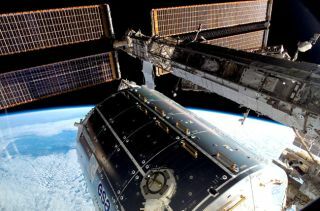 Thearrivalof Columbus at the space station in February 2008, and the successfuldocking and undocking of Europe's Automated Transfer Vehicle (ATV) cargocarrier, have rekindled enthusiasm for microgravity experiments, ESA Human SpaceflightDirector Simonetta DiPippo said. "What we have seen is a rapid increase inthe number of experiment proposals compared to several years ago," shesaid. ESAgovernments in November agreed to spend 285 million euros ($370.3 million)on microgravity missions between 2009 and 2011. In addition to funding hardwareto be sent to the space station, the money will pay for parabolic flights ofcandidate experiments aboard Europe's Airbus 300 Zero-G jet aircraft, and forother ground-based experiment settings. Germany,which is leading Europe's space station work - but for awhile appeared to havelost its enthusiasm - has a renewed appetite for station-relatedinvestment and not only through ESA. InDecember, the German Aerospace Center, DLR, agreed to a joint development withthe China Manned Space Engineering Office of experiments to be launched aboard China's Shenzhou8 manned capsule in 2011. DLR said the agreement, covering 17 medical andbiological experiments, is just the start of a long-term collaboration withChina's manned space program. ESAfor now has not joined China on any manned space projects, but remains open tothe possibility. But the agency is pushing ahead on several fronts that couldmove Europe closer to its own astronaut-carryingcapability. 1.37 billion euros to assure ESA meets its obligation to the international space station's lead agency, NASA, to provide four more ATV flights between now and 2015. This financing will not pay for all four ATVs and their Ariane 5 launch vehicles, because ESA governments wanted to wait for clarification from NASA on how long the station will be operated. But at the insistence of Germany, ESA governments agreed that complementary funding would be made available if ATV contracting teams work faster than expected and need more funding before 2011. 27 million euros to study modifications needed to permit the ATV cargo carrier, which is filled with garbage and destroyed in a controlled atmospheric re-entry after spending up to six months at the station, to return cargo to Earth. Contracts for this work are scheduled to be let starting in mid-2009, DiPippo said. 5 million euros to investigate ways to work with Russia on a new crew transport vehicle. Gone for now is any idea of a major joint venture to produce a successor to Russia's Soyuz capsule. ESAand Russia spent three years in stop-and-start negotiations on such an idea,but European government officials said squabbling over work share amongEuropean companies, combined with technology-export restrictions in Russia andEurope, helped scuttle the proposal. Anotherproblem was that the European side had been tentatively assigned the job ofdesigning a service module for the crewed vehicle that used a future Russianrocket, now being designed, as the point of reference. Europe wanted to work onhardware that would use ATV as a starting point, and Europe's Ariane 5 rocketas the presumed launcher. Butwith European governments still hesitant about embarking on their own programto assure autonomy in manned access to space, ESA officials are continuing toexplore ways to work with Russia on a crew transport system. 11.5 million euros to begin work on a lunar lander. While not an astronaut program at the outset, ESA is funding this work with a view to participating in a global exploration effort to the Moon, and to Mars. An exploration conference in June in Prague is expected to refine an ongoing coordination among 14 space powers, including the United States, Russia, China, Japan and India as well as Europe, in future exploration plans. Germanyis financing most of the ESA lunar-lander study, with Portugal alsoparticipating in the work. The lander design will assume a launch aboardEurope's Ariane 5 rocket.